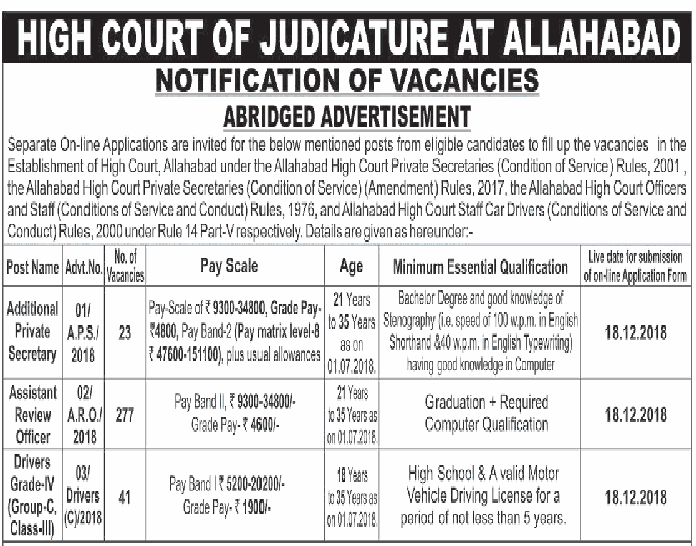 Allahabad High Court Recruitment 2019 Notification total information is shared in this article. There is a total of 341 Additional Private Secretary (APS), Assistant Review Officer (ARO), Drivers Grade IV (Group C), Class III Vacancies are available in the Allahabad HC, for which they released the advertisement. All the interested candidates from the Uttar Pradesh who completed their Education in Graduation from any Recognized Institute or University in India, can go ahead and submit the application form before the final date. Basing on the details available in the official Allahabad HC Recruitment 2019 Notification, candidates have to submit their application by 7th January 2019. After the final date, no application will be accepted. If you are from Uttar Pradesh State and looking for the Government Jobs, then this opportunity is for you all. Please go ahead and check all the Requirements, that an individual has to possess while submitting the application form. Because the officials of High Court of Allahabad are going to reject those applications which are not having all the Qualifications. Now, if the candidates are interested in checking more other government jobs, then they can find other Latest Government Jobs on our site Freshers Now. Now, here in this section, we are providing a table. And that table covers all details clearly. Candidates should complete their Graduation from any Recognized Institute or University in India, as the Educational Qualification. For more detailed information check the notification. Applicants age must lie between 18 years to 35 years. For Age Relaxation details check the notification. Written Test followed by the Interview will be the selection rounds, that an individual will have to clear to get placed in the organization. For ARO & APS Post, Candidates from General and OBC have to pay Rs.750/- while the other has to pay Rs.500/- as the application fee. For Driver Post, Rs.500/- is the application fee for the General and OBC Category applicants, remaining category aspirants have to pay Rs.300/-. Over there, you will find the advertisement. Hope all the information shared about Allahabad High Court Recruitment 2019 is helpful for the Job hunters across the country. Allahabad High Court Recruitment 2018 Notification is released. And through that notification, the officials mentioned the availability of 59 positions of UP Higher Judicial Services (UPHJS Part II). So, if you are from Uttar Pradesh and complete your graduation in Law, then this wonderful opportunity is for you. Check the complete details. And then proceed to apply for the Allahabad HC Recruitment 2018 before the closing date. According to the information in the AHC UPHJS Part II Notification 2018, an individual has to submit the application form by 14th December 2018 in the prescribed format. Remember to check all the details about this recruitment. And then proceed to apply, only if you have had all qualifications. Check the complete details our team from Freshersnow.com is providing about the Allahabad High Court Recruitment 2018 Notification. And then decide it yourself, if you are eligible, for this AHC openings 2018 or not. If you are eligible, without any delay, start applying before the closing date. Because, after the closing date, the officials will not consider your application form, even if you are eligible, and have all the qualifications. We must say that this is a good chance for all the people in Uttar Pradesh State, who are looking for Government Jobs. Here is the help use it and get placed in the Allahabad High Court. Here is a catchy chance for all the people, who are looking for the Government Jobs in Uttar Pradesh State. Use this amazing opportunity, by applying for it starting from 15th November 2018. Well, apply, only if you are interested and have had all the qualifications correctly. If not the officials of the Allahabad High Court will reject your application form. Well, the candidates have to first check about the educational qualification. Because it is important and primary of all the requirements. According to the information in the notification, an individual has finished their graduation in LAW. And they should have 7 years work experience. Along with the educational Qualification, an individual should also have the correct age limit. Basing on the information in the AHC Recruitment Notification, applicants maximum age can be 35 years. Applicants have to pay Rs.1000/- as the application fee while the officials asked the SC and ST people to pay Rs.775/-. Before paying to try to check the details twice. Written Examination followed by a personal interview is the selection process, an individual has to go through. Selected people are going to get Rs.51,550 to Rs.63,070/- Per Month. We shared all the important information about the Allahabad High Court Recruitment 2018 Notification. If you want to check other Recruitment Notifications, then check our site without missing.